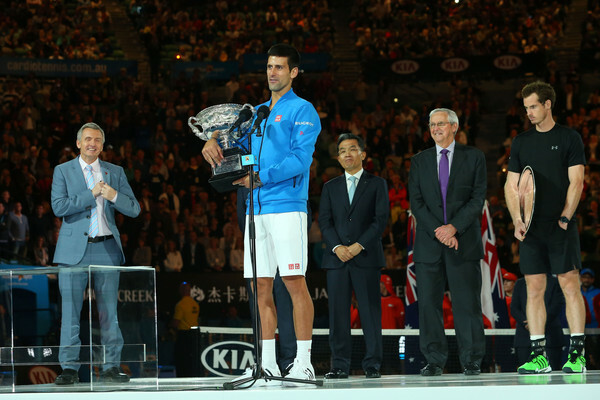 Novak Djokovic solidified his place as the best player in tennis today by capturing the men’s singles championship at the 2015 Australian Open, defeating Andy Murray 7-6 (5) 6-7 (4) 6-3 6-0. It was the second straight bagel closing set for Djokovic, following the 6-0 fifth set he dropped on Stan Wawrinka in the semifinals. The Serbian superstar now owns 5 Australian Open singles title and 8 Major singles titles overall. The 8 Majors ties Nole with Ivan Lendl, Andre Agassi, Jimmy Connors, Ken Rosewall and Fred Perry for 8th on the all-time men’s singles Majors list. Djoker was already a future Hall of Famer, but now he is entering rarefied air. At 27 and healthy, he clearly has a shot at double digit singles Majors. Next to catch would be Bill Tilden at 10. Whether he can reach players like Roger Federer (17 and counting), Rafael Nadal (14 and counting), Pete Sampras (14), Roy Emerson (12), Bjorn Borg (11) and Rod Laver (11) is beside the point. That Nole could even enter conversations with the very highest pantheon of tennis gods is an achievement in itself. Some might argue that he’s already there. If he reaches double digits I can’t imagine he wants to do so bereft of a Roland Garros title. Other great champions like Sampras (Roland Garros) and Borg (US Open) have Majors they didn’t win (I don’t count Borg not having won Australia…a lot of players didn’t even make the trip down under back in those days). So it’s not as if Nole would be alone with one Major missing. Not everybody wins the Career Grand Slam. Future Hall of Famer Maria Sharapova has won the Career Grand Slam, but her resume is not as great as that of Djokovic. Rafael Nadal has owned Roland Garros in his career. Although Nole is set to defend his title as the reigning Wimbledon champion this summer, I have to believe his season is being set-up to give him the best chance possible to win the one Major title that has eluded him. 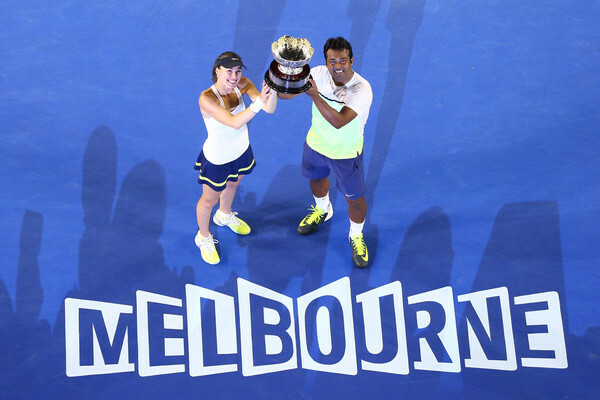 Speaking of legends, Martina Hingis and Leander Paes teamed up to win the 2015 Australian Open mixed doubles crown, taking out the 3rd seeded Kristina Mladenovic and Daniel Nestor 6-4 6-3. If you don’t follow tennis closely, you might not know that Paes is every bit the doubles ace that Hingis is. 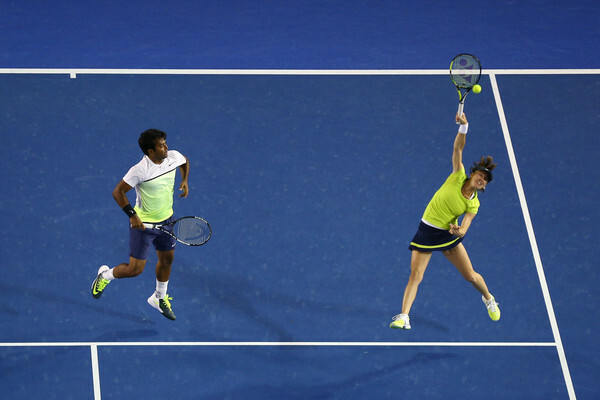 Leander has 8 men’s doubles Majors, including a Career Grand Slam, and 7 mixed doubles Majors. Like Hingis, he is also a former world #1 in doubles. 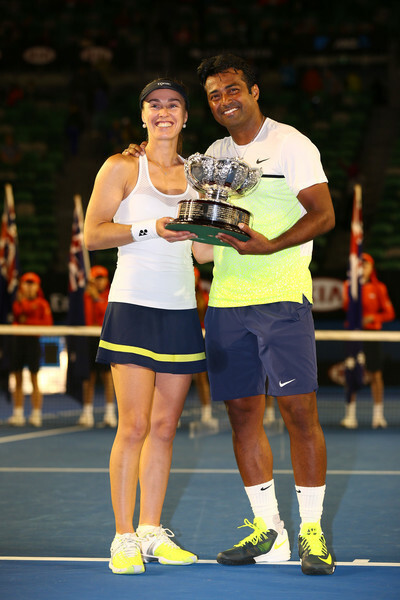 This is Martina’s 2nd Major mixed doubles title (both at the Australian Open) to go along with 9 women’s doubles Majors (including the career Grand Slam) and 5 singles Majors. Only Roland Garros escaped her in singles, finishing twice as runner-up. The time Martina and Leander spent as teammates playing World Team Tennis for the Washington Kastles (that’s how they spell it) had to be a big help. They are both doubles savants and with that time together they could establish trust. Paes spoke afterwards about Hingis suggesting a change of strategy during the final and him having the trust in her to comply. This is a team that has more Majors in them. The doubles comeback of Martina Hingis has turned out to be an amazing success. I hope it continues. Bobby, are you pumped that Seles will play MSG on March 10, 2015? Cover model Hannah Davis and the rest of the beautiful ladies who grace the pages of the 2015 Sports Illustrated Swimsuit Edition are joined this year by two high profile female athletes, former tennis world #1 Caroline Wozniacki and UFC Women’s Bantamweight Champion Ronda Rousey. The 22-time WTA singles champion Wozniacki has seen a resurgence in her game over the last half year. Following a period where she slid down the rankings, Caroline returned to the top 5 on 2.2.2015. She also ran the 2014 New York City Marathon. Sunshine has been around so long that it’s easy to forget that she’s still only 24. Barring injury, I definitely think she will win a Major (or two) before her career ends. Undefeated MMA superstar Ronda Rousey is quickly approaching possibly her toughest test yet as she takes on the #1 contender and similarly undefeated Cat Zingano. Hopefully, Rousey will not be too distracted by outside commitments going into that fight. Rousey has ridden her rising star into roles in The Expendables 3, Fast 7 and the movie adaptation of the popular series Entourage. She has also posed for the 2012 ESPN the Magazine Body Issue. Just a quick little mini-post to congratulate Daniela Hantuchova and Andrea Petkovic on their titles this week. 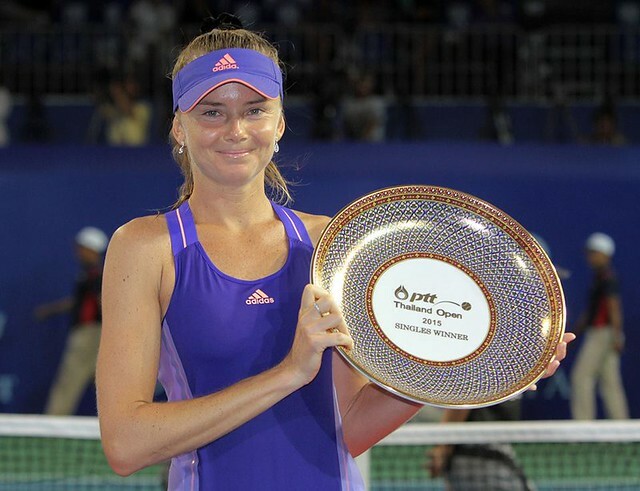 Daniela won the 2015 PTT Thailand Open, her third singles title in Pattaya. She took home the big trophy in 2011 and 2012 as well. It’s her 7th WTA singles title and first since the 2013 AEGON Classic. 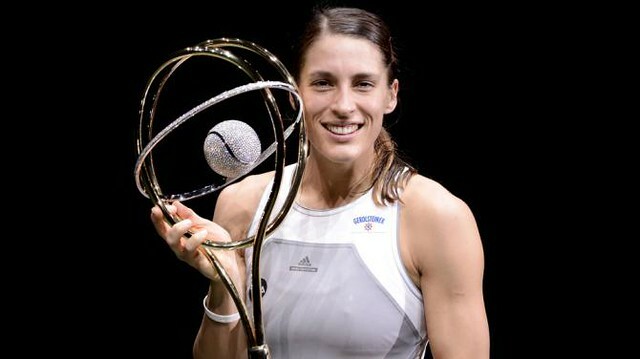 Andrea Petkovic took her 6th WTA singles title with her victory at the 2015 Proximus Diamond Games. Unfortunately, the final was a walkover when Carla Suarez Navarro was forced to withdraw with a neck injury. The crowd in Antwerp, Belgium probably had their disappointment soothed a little by Andrea playing an exhibition match instead against the tournament director, 4-time Major winner Kim Clijsters. Kimmie looked pretty darn good for somebody who has been retired for a while, winning the exhibition with some great shot-making. Last edited by bangkokbobby; 02-20-2015 at 12:16 AM. Simona Halep answered a lot of questions and silenced (at least temporarily) a lot of doubters en route to winning the 2015 Dubai Duty Free Tennis Championships women’s singles title. She came in as the top seed even though Petra Kvitova was ranked higher to start the tournament. Many looked to Kvitova, Caroline Wozniacki, Venus Williams or Ana Ivanovic as better picks to win. Much of this stemmed from Simona’s less than stellar effort in meekly bowing out in the quarterfinals at the 2015 Australian Open against Ekaterina Makarova, losing 4-6 0-6. When the pressure was on at Dubai, would Halep respond? Heck, yes. First up was a rematch in the quarters against Makarova. Simona won the first set 6-3 but was rolled 1-6 in the second. Halepeno would not fold, fighting for a final set 7-5 victory to vanquish the ghosts of Melbourne. Next up she faced Wozniacki in the semis. Sunshine laid a 2-6 drubbing on Simona in the first set. Then Halep caught fire with two triumphant bread stick sets to win, 2-6 6-1 6-1. The final was intriguing against the fast rising Karolina Pliskova, who will ascend to world #12 on Monday. It was a tough match, but Halepeno edged her out, 6-4 7-6 (4). It’s Simona’s 10th WTA singles title and 2nd already in 2015. Unfortunately, she has pulled out of this coming week’s Qatar Total Open. 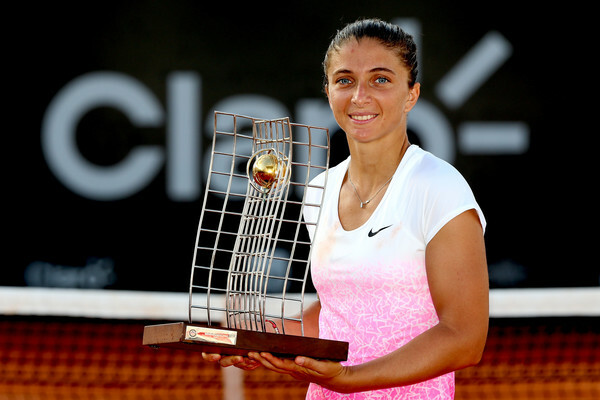 Sara Errani didn’t have nearly the same gauntlet to run through at the 2015 Rio Open, as she was the only top 20 singles player in the draw. Nevertheless, trophies are no guarantee in any sport. Sara still had to go out there and show why she was the best clay court player in this event. Of her 8 WTA singles titles, 7 are now on clay. She was also a finalist at Roland Garros 2012. Her lone hard court singles title came at the 2008 Slovenia Open. Of course, paired with Roberta Vinci in doubles, they are a terror on any surface. Be on the lookout for her opponent in the final, 20-year old Anna Schmiedlova. It was Anna’s first career WTA final. Although she didn’t win, Schmiedlova has a lot of potential and could make noise in the near future. It’s been a great start to the season so far for Lucie Safarova. She won her first Major title with a doubles win at the 2015 Australian Open, teaming with Bethanie Mattek-Sands. Lucie has now added her first Premier singles title by besting Victoria Azarenka 6-4 6-3 to emerge the champion at the 2015 Qatar Total Open in Doha. On the way to the title, Safarova went through Samantha Stosur, Ekaterina Makarova, Andrea Petkovic and Carla Suarez Navarro, the last three being seeded players. Navarro took out the top seed, Petra Kvitova, in the quarters. Lucie earned a measure of revenge for her friend and countrywoman Kvitova by rolling through Carla 3 and 2 in the semis. With her final triumph, the 28-year old Safarova will move to #11 in the world, her highest ever singles ranking. Speaking of best singles rankings ever, Timea Bacsinszky continues her rise back up the rankings by winning the 2015 Abierto Mexicano Telcel in Acapulco. Timea hadn’t won a singles event since 2009, suffered serious injuries since then and had plummeted at one point to 578 in the world. She was basically out of the game in terms of the main tour. Bacsinszky admitted that she was on the verge of quitting the sport in 2013. Thankfully, after making some team changes, she stuck with it. After a long journey back, she will ascend to her best ever ranking of 31 in the world following her win over Caroline Garcia in the Acapulco final, 6-3 6-0. The only thing marring this tournament was Maria Sharapova having to pull out of her semifinal against Garcia with a stomach illness. However, even if Masha had been well enough to play and had won this event, a run to the final by Timea would still have been extremely impressive considering where she once was. At only 25 years old, she has plenty of time to rise even higher than #31. In back to back weeks a WTA tournament final in Mexico featured comeback player Timea Bacsinszky versus rising star Caroline Garcia. Call Timea la Reina de México as she followed her win over Garcia in Acapulco last week with another triumph at the 2015 Monterrey Open this week. In a match that ended in the early hours of Monday due to a prolonged rain delay after the match began Sunday evening, Timea rallied from dropping the first set to win, 4-6 6-2 6-4. As I mentioned in my wrap-up last week, Bacsinszky of Switzerland was on the verge of quitting the tour a few years ago. She’s now in a career rebirth. Timea has reached three finals already in 2015, winning her last two in row. I’d also like to congratulate Caroline Garcia. She knocked out the defending champion, Ana Ivanovic, in the semis only to lose for the second week in a row to Bacsinszky. It’s a tough pill to swallow but hopefully it will make her resolve even stronger going forward. Another Caroline that you might have heard of had a different result in the final of the 2015 BMW Malaysian Open. Former world #1 and current #5 Caroline Wozniacki also rebounded from dropping the first set 4-6 to come back and defeat Alexandra Dulgheru, 4-6 6-2 6-1. It was Sunshine’s second final of 2015 and fourth final since September of 2014. However, it’s her first win of the season and could be a springboard to more titles this season. 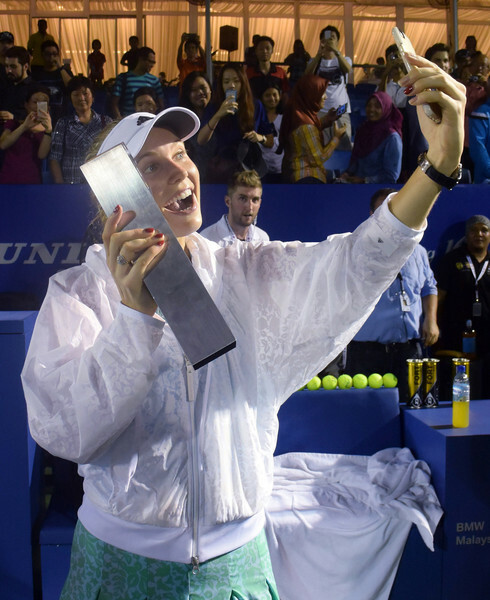 Although the field for Malaysia wasn’t as loaded as some other events, it was still important for the top seeded Wozniacki to emerge the champion. She had the misfortune of running into the comebacking Victoria Azarenka in a couple of tournaments this year, stymieing what has been a resurgence in Caroline’s game over the last 8 to 10 months. Sunshine definitely needed a little momentum going into Indian Wells and Miami. With her 23rd career WTA singles title, she has it. As the year’s first “mini-Major”, I’ve always been a fan of Indian Wells. However, I have waited until day 6 of the 2015 BNP Paribas Open at Indian Wells before writing my first post. 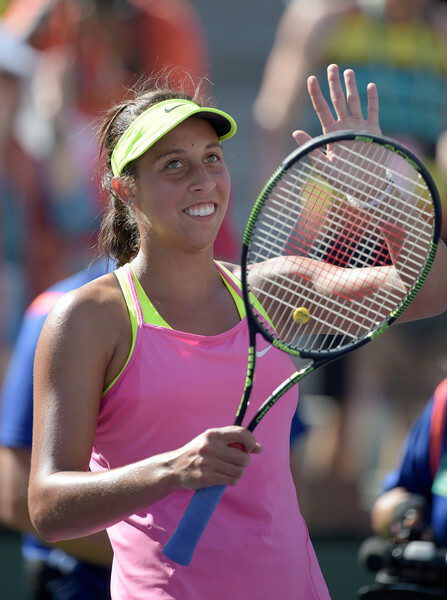 The reason is because I knew this event would mark the return to action of rising American star, and 2015 Australian Open semifinalist, Madison Keys. Knowing she wouldn’t play the first week until Saturday because she received a first round bye as a seeded player, I’ve been holding my breath hoping she wouldn’t be rusty from a month or so of inactivity. No worries. The 16th seeded Keys came out against the dangerous Klara Koukalova and looked very impressive, winning 6-3 6-2. Her serve exhibited that same easy power she’s always been blessed with, taking match point with her 8th ace. She had many other serves that led to points off short returns or errors by Koukalova. The challenge continues in her next match as Madison will face 18th seed and former world #1 Jelena Jankovic in the third round. JJ is crafty, moves well and can extend points. We’ll see if Madison can show the same patience setting up points as she did in Melbourne. Under the coaching tutelage of Hall of Famer Lindsay Davenport and her husband Jonathan Leach, I’m certain Keys will be prepared. Speaking of great third round match-ups, the best of them all will have two former world #1 and multiple Major champions, Maria Sharapova and Victoria Azarenka, battling to advance. Masha took out Yanina Wickmayer 6-1 7-5 while Vika was similarly impressive besting Kirsten Flipkens 6-2 6-4. On paper, Sharapova vs Azarenka is the #2 seed against the #32 seed but everybody knows Vika is coming back from injury. At her best, she is in the same class as Masha. The question that might get answered in the third round is how close to her best Vika is at the moment and will that be enough to overcome Sharapova. They haven’t faced each other since 2013. Vika holds a slim 7-6 won-lost advantage, but Masha has won their last two meetings. Maria Sharapova evened her career record against Victoria Azarenka at 7 games apiece with a 6-4 6-3 third round win at the 2015 BNP Paribas Open at Indian Wells. In a marquee match-up of former world #1s and Indian Wells champions, Masha was the steadier, less mistake-prone player, although it did take 6 match points to finally seal the deal. Both Vika and Masha had trouble with double faults, but overall it was clear that Azarenka still has a little work to do to get back to the level she once shared with Sharapova. In other matches, Eugenie Bouchard advanced in straight sets while both Madison Keys and Caroline Wozniacki were upset. Madison lost a third set lead, falling to veteran Jelena Jankovic while Caroline was taken out by rising star Belinda Bencic. If you look at the cover of Men's Health this month where Justin Bieber looks muscled up and then these recent pictures with his thin arms and legs, I am convinced he has stopped working out or was never as muscular as he appears to be in the magazine or Calvin Klein ads.